Chappée, Archives du Cogner: Les Sceaux du Cogner, Vilaire, 1940, p. 157, no. 153. Bulletins de la Société Historique et Littéraire de Tournai, vol. 21 (1886), p. 143, no. 16. Cioni Liserani, “Alcune ipotesi per Guccio di Mannaia”, in Prospettiva, no. 17 (April 1979), pp. 47-58. C. Leonelli (ed. ), L’Art Gothique Siennois: Enluminure, Peinture, Orfèvrerie, Sculpture(exh. cat. Avignon, musée du Petit Palais, 26 June – 2 October 1983), Florence, 1983. Bellosi, “Il ‘pittore oltremontano’ di Assisi, il Gotico a Siena e la formazione di Simone Martini”, in Prospettiva, no. 121-124 (January-October 2006), pp. 227-36. Because of the crucial role it played at a difficult stage in the city’s governance, this seal-matrix would have been commissioned by the government to a renowned goldsmith – a figure to whom the creation of the most important seals, both for public and private use, was invariably entrusted. Of circular form, it presents an outer perled border, the inscription in modern letters. The choice of the Annunciationfor the seal-matrix had a double resonance in a city that in 1260 had been dedicated to the Virgin Mary. The scene has been skilfully arranged, the confidence of composition indicating that an accomplished goldsmith must be its author. The kneeling Archangel Gabriel present the Virgin with three spikes of wheat, whilst She gracefully holds one hand to her bosom and, in the other, grasps the book She was reading – a motif particularly dear to Gothic artists.3Finally, the Father’s Benediction is represented as a ray of light departing from His Hand. The symbolic meaning was clear: God, through his messenger angel, was directly handing the cittadiniof Siena (the Virgin) their basic source of sustainment, represented by the three wheat spikes. Iconographic sources for the subject would have ranged from Byzantine prototypes to the illuminated manuscripts where these were circulated and evolved. However, the composition appears to reflect, first and foremost, the magnificent synthesis achieved from such precedents by the Sienese Simone Martini (1284-1344) in his Annunciation with St. Margaret and St. Ansanus (1333, Uffizi, Florence, fig. 1). Originally decorating the altar of St. Ansanus in the Cathedral of Siena, the triptych played a major role in the development of the International Gothic style. A suggestive link between the art of Simone and the domain of seals is provided by the artist’s inclusion, in his seminal Maestàfrom 1315 (Palazzo Pubblico, Siena), of the official seal for the city of Siena that had been made by Guccio di Mannaia some years previously (fig. 2). The foremost goldsmith active in Siena between 1291-1318, Guccio also produced a significant number of bronze seals (factores sigillorum). His most accomplished work is the astonishing silver-gilt and enamelled chalice gifted by Pope Nicolò IV (1288-1292) to the Basilica di S. Francesco at Assisi.4 As Martini’s fresco demonstrates, the goldsmith was in the employment of the city’s government. Little of his life and work is known, but his influence is conspicuous in Sienese seal-matrixes from the first half of the Trecento. Compare, for instance, the head of the Archangel Gabriel on the present matrix with that of left angel on the Maestàseal. In particular, note the naturalistic detail provided by the angel’s suspended lock of hair. A second, interesting example is provided by the Seal of Bindino di Neri (Bargello, Florence) datable to the last decade of the 13thcentury (fig. 3).5 Observe the energetically defined drapery folds, the exquisite execution of the wings, but also, once again, the hair, rendered with three stylised locks contouring the profile, as on our seal-matrix. 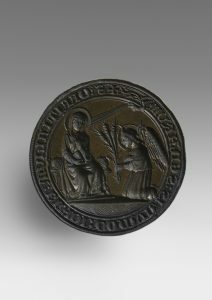 On stylistic grounds, then, this seal-matrix can be dated to the period in between Martini’s Annunciation (1333) and 1348-1355, after which years, following the devastation caused by the Black Death first and then by the arrival of Charles IV of Luxembourg and the end of the government of the Nine, the city of Siena experienced a severe economic decline reflected in the quality and quantity of works of art its elite was able to commission. An industrial, erudite and bibliophile, as well as an accomplished painter, Julien Chappée (1862-1957) amassed a vast collection of Medieval manuscripts and works of art, housed in his property at Le Cogner, in Le Mans. In 1924 and again in 1941, he donated most of his collection, amounting to thousands of documents, to the Bibliothèque Nationale Française. 1Joseph Calmette, Textes et documents d’histoire: Moyen âge, Paris, 1953, p. 275. 3 Cf. Laura Saetveit Miles, “The Origins and Development of the Virgin Mary’s Book at the Annunciation”, in Speculum, 89, 3 (2014), pp. 632-69. 4 See E. Cioni Liserani, “Alcune ipotesi per Guccio di Mannaia”, op. cit., pp. 47-58. 5 E. Cioni Liserani, Sigilli medioevali senesi, op. cit., p. 13, cat. 10.